In touting conservative policies in Republican-controlled states, Jeb Bush claimed, “The Southeast is leading a renaissance in American manufacturing.” Not so. 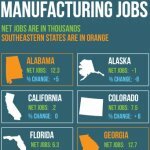 The Midwest has experienced a 9 percent increase in manufacturing jobs since the sector began its recovery in February 2010. Biden overstated — by 1.1 million — the number of manufacturing jobs lost before President Obama took office. He said the U.S. lost 5.8 million manufacturing jobs “during the 2000s, before we came in.” But that figure includes 2009 — Obama’s first year in office.